Supporting hard-working, almost always underfunded pastors is a top a priority of Romanian Ministries, and has been since its inception. 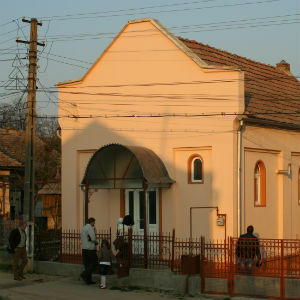 The average salary of a pastor in Romania is approximately £250 a month, reduced immediately by a crippling tax obligation. Pastors often lead more than one congregation, partly in order to make ends meet, and yet often need some form of secular employment as well. It’s been a privilege to meet and help them, especially the “old guard” who endured the opposition of the communist years. Our support takes the form of a monetary gift every six months (ie., each time we make a visit to Romania at the moment), and also, in one case, a gift each month as well. First among our pastors, and perhaps also in our hearts, is Doru Decean of Aiud. Raised in a nominal Romanian Orthodox family, Doru remembers periods in his youth during which he reflected on the existence of God. Although deciding in favour of belief, this had minimal impact on his life, as his impressive bearing and capabilities had led to recruitment by the Securitate, Romania’s much feared secret police. Such a position was much sought after in the Ceausescu era, carrying with it considerable prestige and remuneration. A Christian friend of Doru’s, however, persevered in witnessing to him. Eventually persuading Doru to attend an evangelistic meeting several miles from his home, the message heard touched Doru’s heart and resulted in his immediate conversion. 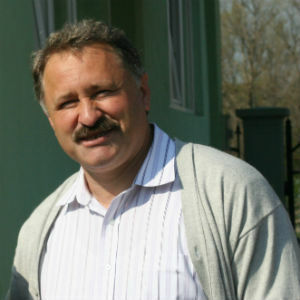 Resigning from the Securitate, Doru soon took up preaching the gospel in villages which lacked an evangelical witness. He worked on a by-faith basis, receiving such support as people felt called to give. Campia Turzii. This congregation reports unity amongst its fellowship and much knowledge of the presence of God. All who know Doru testify to his gracious manner. Adrian regards him as one of the most Christ-like people he has met. Our joy, therefore, has been to provide Doru with monthly assistance, which has allowed his wife to reduce her shifts as a nurse and accompany Doru more often in his ministry. 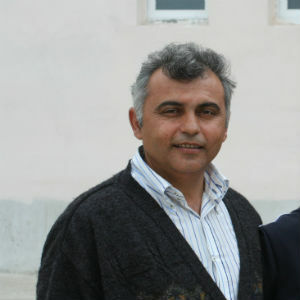 Ghita Sarbu is a church planter and pastor. Hailing from the village of Draut (where Cornel still lives), his most recent labours have been in Horea, near Arad, Western Romania. Following many struggles with local officialdom, he has been used of the Lord to consolidate the Baptist church of the village, seeing it grow from handful of elderly woman to the congregation of about forty five today. Each year sees its own small number of conversions and baptisms. Ghita works as a gateman three days a week in order to assist his family’s finances. While this is doubtless helpful, it has been more than slightly galling for us on occasion to hear his boss giving this godly man rather cursory orders by telephone. Ghita’s wife has a room in her house which she has used for making clothes to sell. Health has at times been a problem for this family, but Ghita has soldiered on, and is a much valued friend whom we are glad to support. Marcel lives in the gypsy village of Batar, Western Romania. 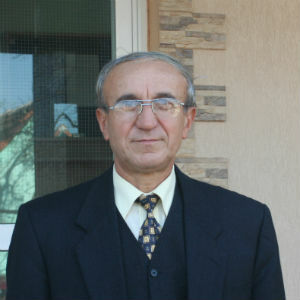 He is pastor of a church in the village, and also director of the “gradinita” (infants school), whose building was constructed through his co-ordination and labours in 2009. Marcel is a lively and extrovert character, full of ideas and enthusiasm, and generally impossible for other people to quite keep pace with. The gypsy village in which he works is not to be visited by those who stand averse to their hearts being bruised or well-nigh broken. Lines of ramshackle, sometimes single-roomed houses serve as homes for families who may have up to 10 children. Sanitation and washing facilities are scarce. Death by starvation, and certainly by undernourishment, is not unheard of. Illness visits the village often. In the midst of this, the gypsies (or Roma, as they are often called), with their good looks and boundless energy, do the impossible and somehow manage to shine, but this is in the face of the grimmest adversity. The need of the gospel in such locations is manifest, and it’s a privilege to provide some financial support to Marcel in his work. Daniel was added to our list of pastors in Spring 2013, in a way marked by providential over-ruling. Adrian’s Romanian-speaking remains a work-in-progress, and his request for Doru to identify an older pastor for Romanian Minsitries to support actually came out as a “younger” pastor, and hence 40 year old Daniel. Daniel is pastor of three churches, one of them under construction, in villages which lack any other evangelical congregation. Their small size meant that he started his work on the basis of promised funding from some Americans, which sadly failed to ever materialise. This, it has to be said, is extremely unusual. American Christians have led the world in giving aid to Romania, and that by a huge margin. In Daniel’s case, however, and for both him and his family, there was disappointment. And yet the wonderful thing, by the Lord’s good grace, is that Daniel has persevered. He continues in his churches to this day. His ten years of labours have taken their toll, with Daniel reporting that he has felt “crushed” at times. 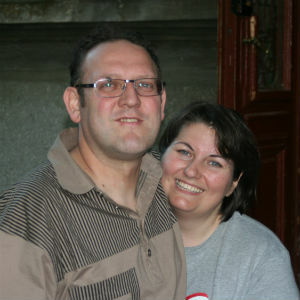 He works as a minibus driver during the week, providing for his family, preaching often in the evening and on weekends. He’s a gracious man, and it’s been so good to share in his labours. 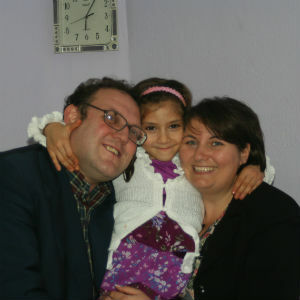 Emi is pastor of a Baptist church in the village of Seleus, again near to Arad. He started there in 2000, following his conversion as a teenager andsubsequent seminary training. 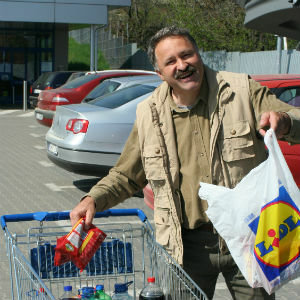 He speaks excellent English, translating sermons into Romanian most effectively, and is a very good preacher himself. He is married to Marcela, a director of an activity day centre for children. He summarised succinctly the position of many a pastor in Romania on one occasion by saying, “without help from others, we simply could not survive”. 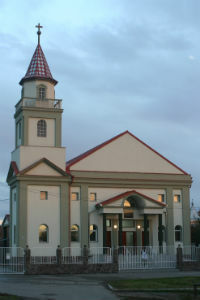 One of the churches (right) which Daniel Petrut pastors. On the weekday evening service we attended, we were the only ones in attendance until about ten minutes after the start time, when a handful of others came and joined us! Food gifts (left) for poor families are one of the things we often do when visiting Doru in Romania. Far more than just an act of courtesy, such food underlines a pastors concern for the very poor, consolidates Christian witness and, by the look of the photo, is something Doru very much enjoys doing! 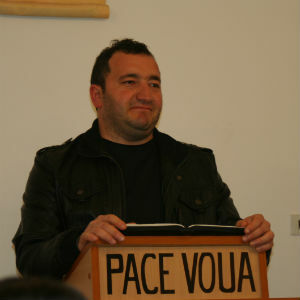 Pastor Daniel Petrut preaching in one of his three churches. His warm and gracious manner recommend him to all.